Be a Pro! Sign up to stay true to your brand and get the most out of the email signature management and marketing or create a basic free signature to add a personal touch to your email. 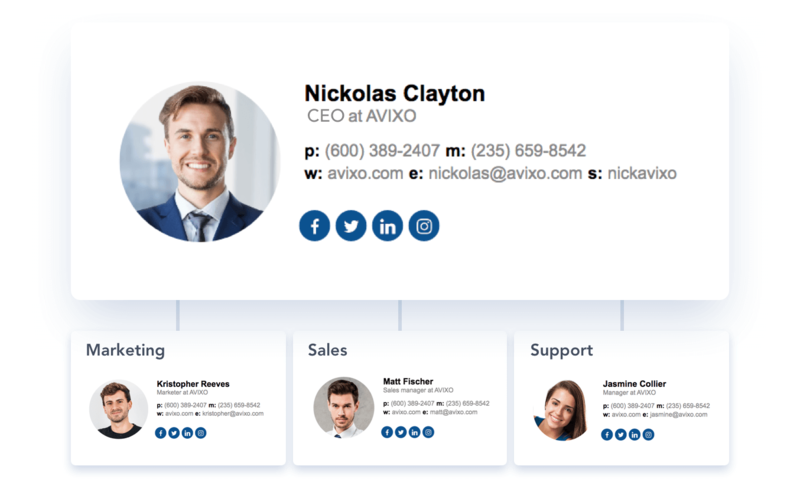 Streamline brand consistent email signatures across entire company employees that follow your guidelines. 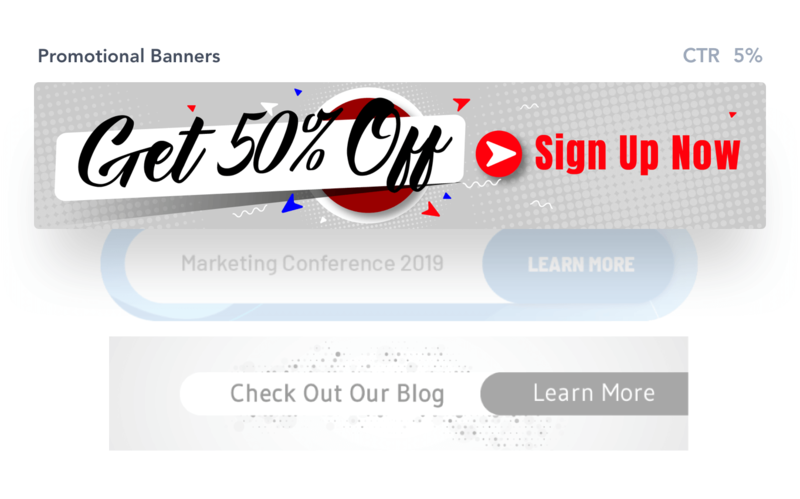 Increase marketing and sales conversions through your business email communication and running signature banner campaigns. Manage all email signatures from one dashboard. Quick and easy signature set up. Seamless integration with major email clients and devices including smartphones. Choose the best and most fitting design from a templates gallery to create a signature that will highlight your competence and expertise. Pick vertical, horizontal or even right-hand side templates to make your email communication more efficient. Minimalistic and elegant designs will help to focus on the most important details. Create a personal signature for free and anticipate its style before installing to your email client. Edit your template and see all changes immediately in our generator to be sure that the personal signature is visually attractive. 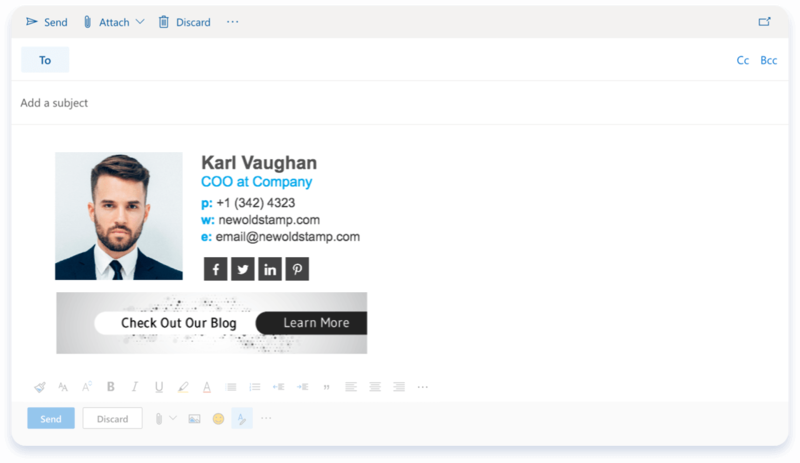 Use the NEWOLDSTAMP maker to create a free online email signature that will look good in all email clients. We assure the proper working of HTML signatures with Gmail, Outlook, Apple Mail, iOS, Thunderbird and others. NEWOLDSTAMP free signatures for your email will remain perfect on all devices. 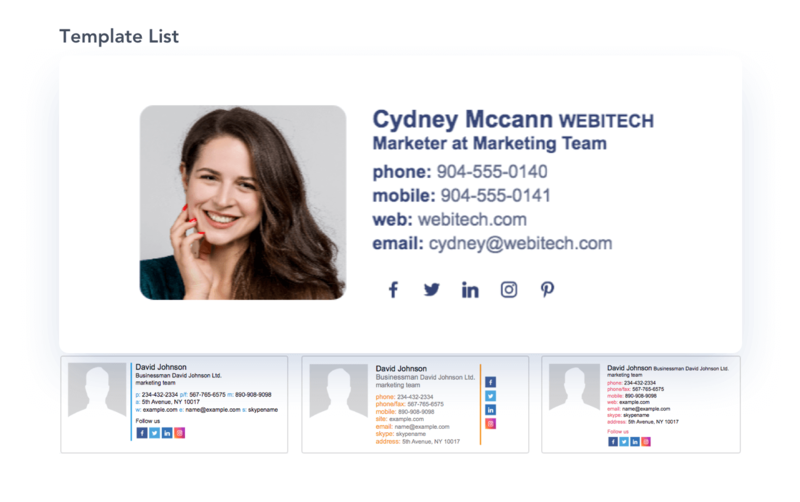 Our free online email signature maker enables adding social icons to increase trust and prove your professional skills by providing quick access to your most active social profiles. You can link to LinkedIn, Facebook, Twitter or Instagram accounts. 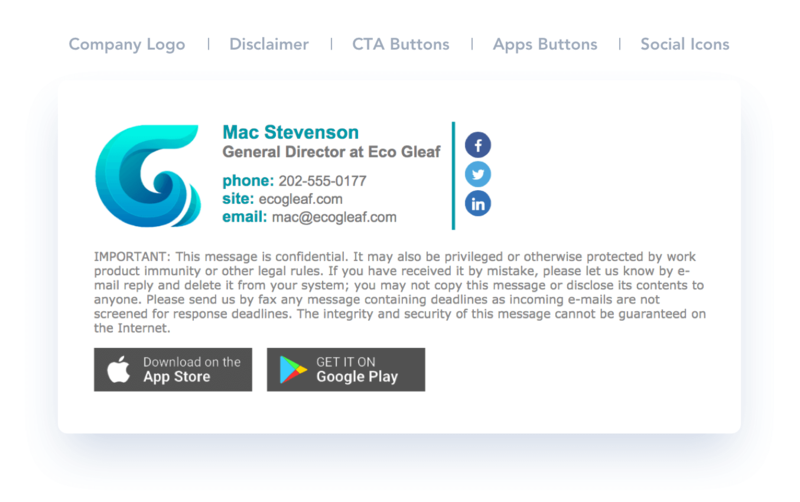 Copy and Paste your design from a free email signature tool to your email client. NEWOLDSTAMP does not require an installation of any additional software or browser extensions. Use our signatures maker, templates and other features online. Use NEWOLDSTAMP generator to create business signatures. We have a wide range of professional signature templates. A life preview helps to create a professional signature design that follows your brand book. See all the changes at once to tune up the signature style. As a result, you will get an HTML code that works with major email clients. Use our web-based tool to design and manage your email signatures without extensions or desktop apps. NEWOLDSTAMP does not require an installation of any additional software on yours or teams’ computers. We are the independent signature software. You do not need to install, integrate or provide access to any part of our software to your servers. Our cutting-edge technologies grant you secure and transparent usage and management of your signatures. Increase your brand awareness within seconds. Create a professionally made signature design for all your employees. Lay out, duplicate and share signatures with your team members. Simply make, use and share company signatures in minutes. Use professional email signatures templates to improve your brand identity. Choose the one you like and customize it to meet brand and business needs. Pick your font style and colors. Add graphical elements. Use the image editor to change the size and shape of your company logo/photo. Change an order or add custom fields. 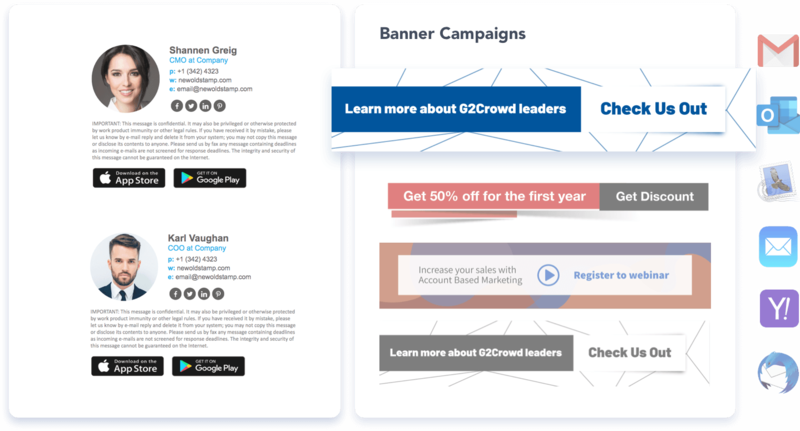 Add banners and grow your social followers to boost your marketing or sales process. 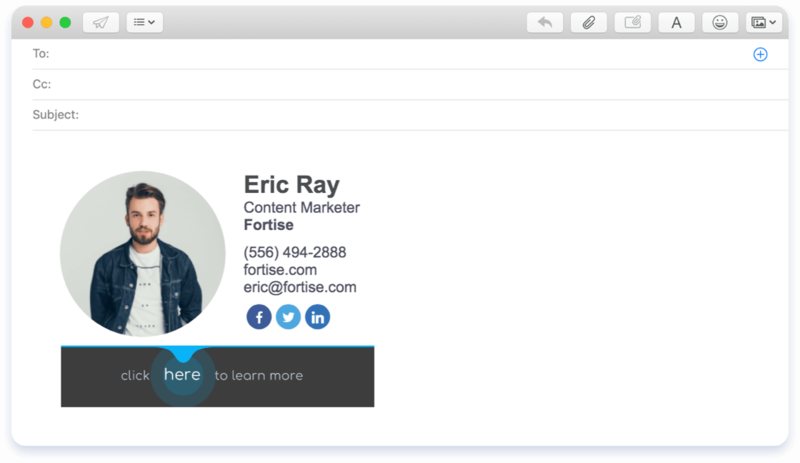 Create and manage your team’s email signatures in one place. Design master signature layouts for each department to run marketing campaigns. You can control and update company signatures in each department separately. Change banners and logos or photos without asking your team to update email signatures in the email client. Share ready-to-use corporate signatures with your team. Or ask them to update their business contact details in the layout you have set up for them. Share a link to the generator with the signature layout. Advance your sales and marketing strategies by using our email signatures marketing tool. Add promotional banners to skyrocket your sales and share special offers, company news or future events. Launch several campaigns at the same time in different departments to reach the goals of each of them. Check banner campaigns analytics to track performance. Add a disclaimer to ensure legal commitment. Drive action and stress on events. Add call-to-action buttons to your business signatures. Promote your apps in the Apple Store, Google Play, Amazon or eBay. Add buttons with direct links to download and install your app. Grow followers of your business pages and groups. Just set up social buttons and social media icons to your signature and link them to your profiles. We've Created Over 1,200,000 Professional Email Signatures for Business. We were looking for new and fun ways to bring messages to customers/prospects. Signatures are now a part of our Marketing strategy/efforts. It helps to make a difference easily with a channel used and eventually liked by all. NEWOLDSTAMP will help you to create a Gmail signature online for free. 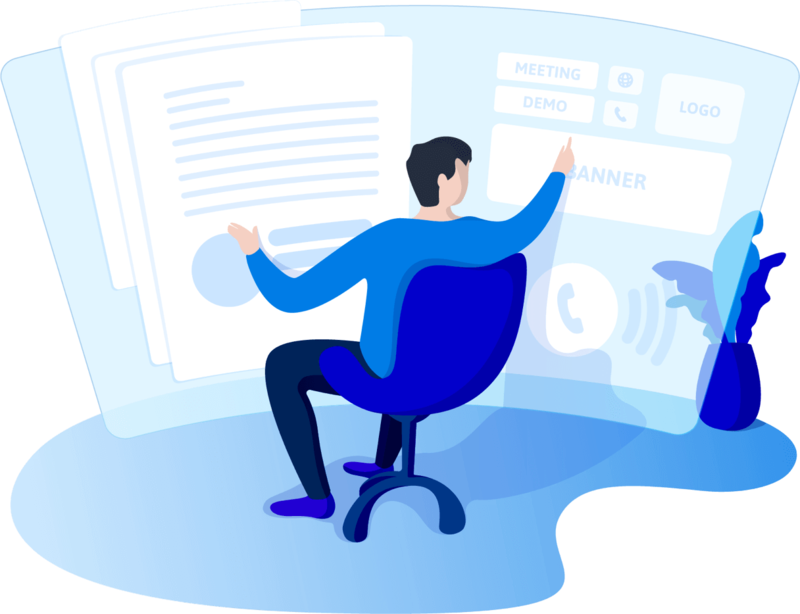 Our intuitive and easy-to-navigate online generator allows you to build personal signatures without any coding or HTML skills. The seamlessly integrated Gmail signatures are fully responsive in all browsers and on all devices. Unbelievably simple-to-use, our best email signature generator is free to help you create a personal signature for Outlook. By replacing an ordinary “Best regards”, this sign off will become the perfect addition to your email communication. Newoldstamp is a handy free HTML email signatures generator for Apple Mail. Our templates look great on Mac OS and iOS. With an attractive Mac Mail signature, you can be sure to make a lasting impression on your recipients. Why Do You Need to Use Special Tool to Create Company Email Signatures and not do it by yourself? You have to be sure that your signature looks perfect every time you send your business email. HTML signature is the only way to do that. Our signature creator allows you to make a consistent email signature. You don't need to have coding skills, involve a tech team or third-party developers and designers. Save time and your money. Make the process of creating professional signatures for all employees easier. Make multiple signatures quickly and use them as a new marketing channel. Don't bother your teammates with signatures' updates. Run signature campaigns and change banners from our dashboard. 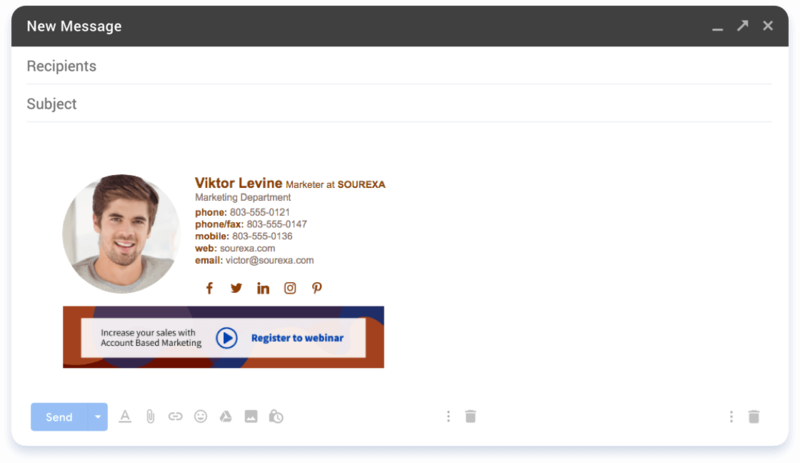 Do You Still Wonder If You Need a Business Email Signatures Creator? Make your email to stand out from the crowd. Add a unique and professional signature. That will make your recipient send a prompt reply. Your signature is your digital business card. Our generator will help you to make a signature that will have your contact and business information. Add all contacts including your email, phone number. Make a great design of your business signature with the help of the signature editor. You can simply create a signature that promotes the company and its brand. You can choose from a wide range of ready-to-use professional signature templates or make your signature. It's a good idea to use professional signatures software. It's super easy and you do not need any special skills to master it. Make yourself different. Create a custom-made signature with NEWOLDSTAMP.